In Blackjack Progressive, you always know that the dealer will stand on all 17s. You can split, but you cannot re-split. Aces can be split, and split aces get one more card before you must stand. If card drawn on a split ace has a value of 10, the hand counts as 21, not as blackjack. If you want to double down, the cost is equal to your initial bet. You can double down after a split, but not if you have been dealt a blackjack. Finally, insurance is available, but surrender is not. 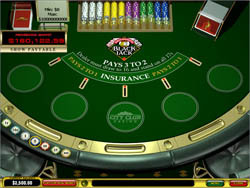 In Blackjack Progressive, bets are made with one of 7 different chip sizes, and can range from 1 to 300 GBP/Euro/USD. Payout for blackjack is 3:2, for insurance is 2:1, and for a standard win is 1:1. The graphics in Blackjack Progressive are top notch. Everything is crisp, colorful, and looks very realistic. Subtle animations, which can be turned off if you like, grace the cards and chips, adding another dimension of realism. It is best to keep the animations, however, because they work well even with older computers and do not slow down gameplay at all. Playing the game is smooth and natural, with all the buttons in the right place, never getting in the way of your view of the table. Everything was thought out very well when this game was designed! Always place a side bet. With six decks in the mix, that means there are 24 aces out there to show up in your hand. Getting one aces is pretty common, and even that pays out at 5:1. You’ll definitely regret not paying the extra one credit when you hit 3 or even 4 aces in a winning hand! Blackjack Progressive is another great blackjack game from the wizards at Playtech, but it is more than that – it is a potential gold mine! The progressive payouts are all quite big, and all involve Aces, so if you get blackjack, that means you get a progressive win too! They tend to pay out more than similar side wagers in other games. This is a good money maker, plus it’s fun to play.